A prize competition often starts with a problem. In order to get help to find a solution, people need to clearly understand your problem. Understanding and effectively communicating your problem isn’t easy, but it’s necessary. Problems are like spaghetti—messy and complex, says Denys Resnick, Executive Vice President of Strategic Programs at NineSigma Inc., which provides open innovation services. Resnick joined Denice Shaw, the lead for challenges and prizes at the U.S. Environmental Protection Agency (EPA), for a recent webinar on how to approach defining and describing problem so that it can be successfully addressed. The Untangling your Technology Challenge and Charting a Successful Path Forward: A Problem Definition Webinar from DigitalGov University (DGU) looked at various aspects of getting everybody on the same page in terms of understanding a problem. This is a crucial step that comes before deciding what approach to take, be it a challenge or another method such as a grant or contract. A problem definition workshop can help. This is when organizations and stakeholder groups gather to sort through differing perspectives, outcomes and benefits. The latter statement spoke to a professor in Indiana, who found a polymer that would relax cotton fibers when sprayed on the surface. Once a problem is described, then it can be solved. But “understanding your problem can take longer than you anticipate,” Shaw says, particularly when there are many different players involved. 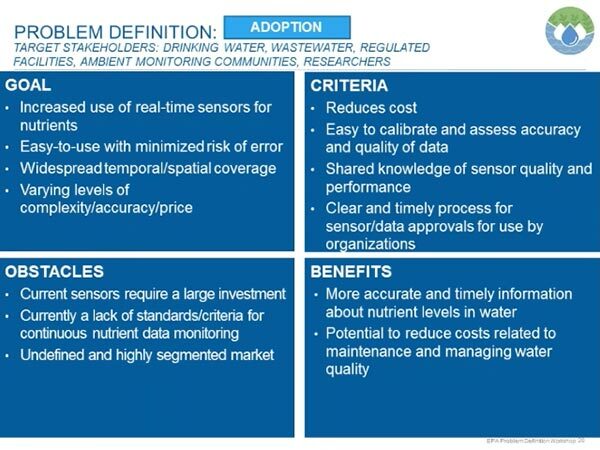 Case in point is the task of monitoring nutrients in water to root out pollution. The workshop explored the issue with fresh insight and differing perspectives and eventually framed the problem so it could be effectively addressed and objectives could be identified. The coalition came up with strategies and tools that would address the needs of a range of stakeholders associated with drinking water, wastewater, regulated facilities, researchers and more. One way to address the problem was to run challenges, like EPA’s Visualize Your Water challenge, which includes 10 partners across government, industry and academia. The series of Head Health Challenges also used a problem definition workshop. These challenges, aimed at reducing traumatic brain injury in athletes, military service members and others, was sponsored by a group of collaborating organizations with very different agendas. The National Institute of Standards and Technology was the lone government agency partnering with industry powerhouses General Electric, the NFL and UnderArmour. A workshop helps define a problem, but it doesn’t always bring a group to a single definition of success. Rather, it helps group members envision what success would look like, Resnick says. Missed the webinar? Watch the webinar recap to learn more about how the process played out for the Head Health challenges and what a problem definition workshop might look like if you arranged one for your problem.